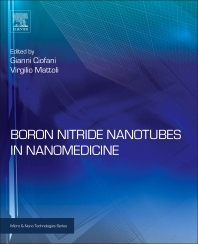 Boron Nitride Nanotubes in Nanomedicine compiles, for the first time in a single volume, all the information needed by researchers interested in this promising type of smart nanoparticles and their applications in biomedicine. Boron nitride nanotubes (BNNTs) represent an innovative and extremely intriguing class of nanomaterials. After introducing BNNTs and explaining their preparation and evaluation, the book shows how the physical, chemical, piezoelectric and biocompatibility properties of these nanotubes give rise to their potential uses in biomedicine. Evidence is offered (from both in vitro and in vivo investigations) for how BNNTs can be useful in biomedical and nanomedicine applications such as therapeutic applications, tissue regeneration, nanovectors for drug delivery, and intracellular nanotransducers. Academics, industry researchers, and PhD students in materials science, life sciences/biology, molecular biology, pharmacology, chemical-, material- and biomedical engineering, physical and biophysical sciences, radiology, and neuroscience. Gianni Ciofani (born on August 14th, 1982) is Associate Professor at the Polytechnic University of Torino, Department of Mechanical and Aerospace Engineering (Torino, Italy) and Senior Researcher at the Italian Institute of Technology (IIT), Smart Bio-Interfaces Research Line (Pontedera, Pisa, Italy). He received his Master Degree in Biomedical Engineering (with honors) from the University of Pisa, Italy, in July 2006, and, in the same year, his Diploma in Engineering (with honors) from the Scuola Superiore Sant’Anna of Pisa, Italy. In January 2010, he obtained his Ph.D. in Innovative Technologies (with honors) from the Scuola Superiore Sant’Anna. From January 2010 to August 2013 he was Post-Doc at the IIT, Center for Micro-BioRobotics @SSSA, where, from September 2013 to October 2015, he was Researcher in the framework of the Smart Materials Platform. In October 2015 he was appointed Associate Professor at the Polytechnic University of Torino, maintaining his research activity in IIT where he is currently Principal Investigator of the Smart Bio-Interfaces Research Line. His main research interests are in the field of smart nanomaterials for nanomedicine, bio/non-bio interactions, and biology in altered gravity conditions. He is coordinator or unit leader of many grants/projects, and in 2016 he was awarded a European Research Council (ERC) Starting Grant. Gianni Ciofani is author of more than 100 ISI papers (H-index 25, excluding self-citations), 3 edited books, and 12 book chapters. He delivered about 25 invited talks/lectures in international contexts and, for his research activity, he was awarded several national and international prizes. He serves as Reviewer for more than 100 international journals and as Editorial Board Member of the International Journal of Biological Engineering and of Advances in Nano Research; he is Senior Editor of Nanomaterials & Nanosciences and Associate Editor of Frontiers in Nanobiotechnology. Gianni Ciofani is professor of Biomimetic Systems and Bionanotechnologies, and supervisor of several M.Sc. and Ph.D. students. Associate Professor at the Polytechnic University of Torino, Department of Mechanical and Aerospace Engineering (Torino, Italy) and Senior Researcher at the Italian Institute of Technology (IIT), Smart Bio-Interfaces Research Line (Pontedera, Pisa, Italy). Virgilio Mattoli received his Laurea degree in chemistry (with honours) from the University of Pisa and the Diploma in Chemistry from the Scuola Normale Superiore of Pisa in 2000. In 2005 he received his PhD in bio-engineering (with honours) from Scuola Superiore Sant’Anna, with a thesis focused on the control and integration of miniaturized devices for environmental application. In 2004 he was visiting researcher at the University of Stanford, Center for Design Research, where he focused his activity on sensors and controls modules for biomimetic robotics applications. In 2005 and 2008 he was a short term visiting researcher at Waseda University (Tokyo, Japan) working on a bio-inspired mini-robot and on development of ultra-conformable polymeric films. From June 2008 to October 2009 he obtained a temporary position of Assistant Professor of bioengineer engineering at the Scuola Superiore Sant’Anna (SSSA). Since November 2009, he has been a Team Leader of the Smart Materials Platform in the Center for Micro-BioRobotics of the Istituto Italiano di Tecnologia. His main research interests include: smart and bio-inspired materials, nanomaterials, ultra-thin polymeric films, thin film sensors, sensor conditioning, miniaturised acquisition system and biorobotics. He is currently involved in several research projects on these topics. He is author or co-author of more than seventy articles on ISI journals, of more than forty full papers published in peer-reviewed international conferences proceedings and of several deposited patents.